Lomana LuaLua has always been grateful for the privileges granted by a career as one of Africa's biggest football stars. But still it took a chance meeting of painful poignancy for the DR Congo captain to realise it was time to start putting something back into his war-ravaged homeland. Returning to the capital Kinshasa in the aftermath of the 1998-2003 civil war that created more than a million refugees and tens of thousands of orphans, the deeply religious LuaLua was shocked by the sight of under-aged girls prostituting themselves to survive. "I saw a lot of very young girls out on the streets, doing things they were not happy about," the 26-year-old recalls. "But they had to do it to get money to survive and for education. "One day we had a game and we won that game so we all decided to go out. "I had some of my cousins with me and there was this girl who wanted to talk to me, but I wasn't interested, so I passed her on to one of my cousins to speak to. "They started dancing and talking and it came out that all three of us were related but she was a prostitute. "It hurt knowing that and God knows what would have happened that night if I was one of those people that thought 'yeah I'm going to sleep with her.' I would have ended up sleeping with a relative." After discussions with his family and friends about how best he could help children facing a similar plight, the LuaLua Foundation was born. With an estimated US$180,000 of his own money, LuaLua has built a complex in Kinshasa to cater for dozens of orphaned children of all ages. As well as providing a caring environment for kids who have lost both parents, it also gives them an opportunity to fulfill their potential. The project is now in its second year. Its educational facilities have few equals in the country and there is even a small football academy for a handful of boys who might one day emulate LuaLua's achievements in the game. "There are 10 of them in the academy but they are not just there to play football," LuaLua said in an interview. "They are learning other things as well." 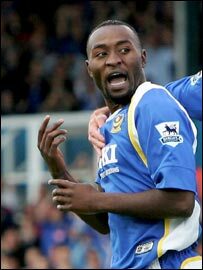 LuaLua, who is best known to most football fans for his acrobatic, back-flipping goal celebrations, spent his teenage years in England having left the country then known as Zaire as an eight-year-old. But the link with his homeland has never been broken and, once his football career is over, he plans to return to Africa, drawn by what he describes as the "bigger plans" God has for his life beyond football. "When I retire, I will be back in the Congo doing the project full-time because there is nothing better than being around those kids. "If you talk to people back home in my country they will tell you it's unusual to see someone who is a star in Europe to go back and be around people. "I play football without shoes with those kids, I sit down on the ground in the sand with them and I eat the same way and same food they eat, just to show them that I'm one of them. And I thank God for giving me that humility to be able to do that."